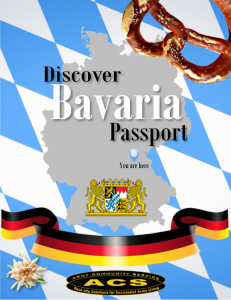 GRAFENWOEHR, Germany — United States Army Garrison Bavaria Army Community Service offers newcomers an opportunity to get to know Bavaria while collecting stamps in the Passport Challenge booklet. “This program is designed to make the spouses feel welcome in USAG Bavaria, and it should also help to integrate and connect them better within the new environment,” said Roswitha Ebnet, Relocation Readiness program manager. The ultimate goal of the new initiative is to connect families to the USAG Bavaria community and help build ready and resilient families. “The target audience is spouses, but everybody is welcome to participate,” said Ebnet. Newcomers benefit from the program by learning about the local area and the culture of the host nation while making friends and new connections. After each tour or class, the participant gets a stamp in his or her passport booklet. Stamps are collected at the newcomer’s orientation, German language classes and tours. The tours include a windshield tour of Tower and Rose Barracks and a guided tour of Weiden and Amberg. Once the booklet is completed, participants take the completed booklet to ACS and receive a certificate and an insulated shopping bag. “The stamps should be collected within two months, but if it takes a little longer it is not a problem,” said Ebnet. The passport booklets are available for pick up at Tower Barracks ACS Bldg. 244 and Rose Barracks ACS Bldg. 322. For more information on ACS Relocation Readiness program, call DSN 475-8371 or 476-2650 or visit the website at grafenwoehr.armymwr.com/programs/army-community-service-acs.